Introduction: Endodontic treatment is done to eliminate the potential sources of infection from the root canal space. Having extensive knowledge of the exact of internal anatomy of root canals is a prerequisite for a successful endodontic treatment. It is abnormal to have a second palatal root in a maxillary second molar; however, accurate diagnosis could provide a suitable treatment. Case Presentation: The current study reports on a 20-year-old female with a maxillary second molar with two palatal roots. Using the cold lateral compaction technique, the canals were filled with gutta-percha and AH26 sealer. Additionally, a detail description of the treatment and its management is provided in this report. Conclusions: On the third month of follow-up, all signs had disappeared and the patient showed no sign of periodontal ligament space widening. The objective of endodontic treatment is to eliminate the potential sources of infection from the root canal space, including pulp tissue remnants, microorganisms, and bacterial products. To perform a proper endodontic treatment, it is essential to obtain precise knowledge of the internal morphology of root canals (1). Studies have shown that root canal treatment might fail due to the complex internal anatomy of the root canal, which prevents the elimination of bacterial biofilms from the root canal system. 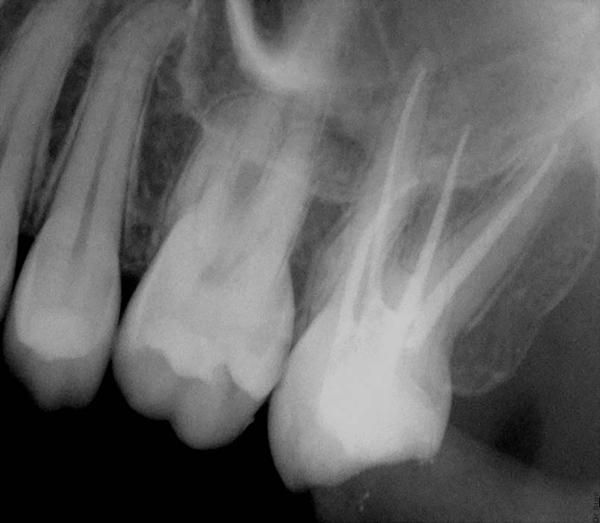 Therefore, endodontic treatment of canals with abnormal morphology can often be a challenge (1). Usually, maxillary second molars have three roots and three canals. It is more common for the first molars to have an additional canal in their palatal roots (2, 3). Presence of a fourth root canal in the maxillary second molar is reported to have a prevalence of less than 1% (4). Some studies have mentioned the presence of an additional palatal root or canal in the maxillary second molar, yet few clinical case reports have been published on this matter (5-8). Studies conducted by Shalabi, Green, and Vertucci did not report the presence of two palatal roots in the maxillary second molar (9-11). In a study on individuals over 40 years old, 14 patients were reported to have two palatal roots in their second molars (12). In 2003, Alani presented a case report involving a maxillary second molar with two palatal and two buccal roots (13). In a case report published in 2012, Ghoddusi et al. 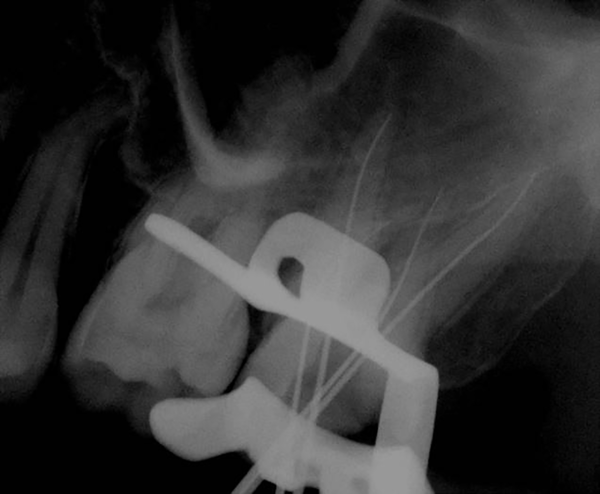 introduced a patient, who had a maxillary second molar with two palatal root canals (14). The present case report aims at introducing a patient, who had a maxillary second molar with two palatal root canals and describes the treatment procedure. The patient was a 20-year-old female, with no specific medical conditions, who visited the endodontics department of the Shiraz School of Dentistry with the chief complain of spontaneous pain, pain while chewing, and sensitivity to cold water on the right side of the mouth, behind the maxilla. Clinical and radiographic findings showed that the molar had widening of the periodontal ligament space and deep cavities on the occlusal and distal sides. Furthermore, periodontal probing was normal (Figure 1). Results from pulp vitality tests showed irreversible pulpitis. After administration of local anesthesia (2% lidocaine with 1:80000 epinephrine) and isolation with the rubber dam, decay was removed using a round carbide bur and access was provided to the cavity via a round diamond bur. Evaluating the pulp-chamber floor, four orifices were detected, two palatal and two buccal (Figure 2). An apex locator was used to determine the length of the canals (#15 and #20 K-files) and routine intraoral periapical radiography was utilized to confirm the determined lengths (Figure 3). The ProTaper NiTi rotary filing system and the crown-down technique were used to clean and shape the root canals. Then, the canals were washed at the same time with sodium hypochlorite 25.5% for the purposes of disinfection. Using the cold lateral compaction technique, the canals were filled with gutta-percha and AH26 sealer. After a temporary filling was placed in the access cavity, the patient was referred to a prosthodontist for permanent restoration (Figure 4). On the third month follow-up, all signs had disappeared and the patient showed no sign of periodontal ligament space widening (Figure 5). The key to a successful endodontic treatment is first to find an accurate location of the root canals, and then, proper cleaning, shaping, and sealing of the canals (15). In one literature review, Libfeld et al. studied the incidence of four-rooted maxillary second molars through a radiographic survey of 1200 teeth. Their results revealed that 0.4% of the teeth under study had four separate roots (4). A 1985 study described the root canal treatment of a maxillary second molar with two palatal canals and a palatogingival groove (16). In another study by de Almeida-Gomes et al., the authors showed the endodontic treatment of a maxillary second molar with two palatal roots (6). Moreover, Christie et al. described the treatment of maxillary molars with two palatal roots in a retrospective study (12). In 1999, Deveaux presented a case report involving a maxillary second molar with two palatal roots (17). Another case study in 2003 described the root canal treatment of maxillary second molars with four separate bilateral roots (13). Interestingly, all the aforementioned studies were in line with the current findings. In a retrospective study in 1996, Peikoff et al. introduced six anatomical variants for maxillary second molars, including: (1) three separate roots and three separate canals (56.9%); (2) three separate roots and four canals (two in the mesiobuccal root) (22.7%); (3) three roots and canals with combined mesiobuccal and distobuccal canals (9%); (4) two separate roots with a single canal in each (6.9%); (5) two separate roots and canals (3.1%); and (6) four separate roots and four separate canals, including two palatals (1.4%) (18). According to this classification, in the current case, the molar belonged to the last category. Even though in the current study, the abnormal anatomy of the roots and the presence of a fourth root could be observed in the periapical radiograph to some extent, one must not overlook the help of CBCT in confirming the four-rootedness of the molar. In a study in 2012, Versiani emphasized on the importance of using CBCT in the morphological evaluation of maxillary second molars with four roots (19). Due to its posterior position and the superimposition of anatomical structures, the chances of detecting a second palatal root are quite low. Considering the limitations of routine radiography in detecting such anatomical variations, it might be essential to make use of microscopes, visual techniques, and CBCT in this respect. The current case report was significant for understanding the complexities and anatomical variations to provide suitable endodontic treatment, knowing the possible deviations occurring in treatment of teeth with special anatomies and most importantly, knowing the region of the tooth to look for additional canals. Hence, paying attention to these factors would increase the possibility of successful root canal treatment and reduce the chances of failure in endodontic treatment and apical surgery. The authors wish to thank Mr. H. Argasi at the Research Consultation Center (RCC) of Shiraz University of Medical Sciences for his invaluable assistance in editing this manuscript. 1 Nosrat A, Schneider SC. Endodontic Management of a Maxillary Lateral Incisor with 4 Root Canals and a Dens Invaginatus Tract. J Endod. 2015;41(7):1167-71. doi: 10.1016/j.joen.2015.02.013. [PubMed: 25799535]. 2 Kottoor J, Velmurugan N, Sudha R, Hemamalathi S. Maxillary first molar with seven root canals diagnosed with cone-beam computed tomography scanning: a case report. J Endod. 2010;36(5):915-21. doi: 10.1016/j.joen.2009.12.015. [PubMed: 20416446]. 3 Aggarwal V, Singla M, Logani A, Shah N. Endodontic management of a maxillary first molar with two palatal canals with the aid of spiral computed tomography: a case report. J Endod. 2009;35(1):137-9. doi: 10.1016/j.joen.2008.10.012. [PubMed: 19084144]. 4 Libfeld H, Rotstein I. Incidence of four-rooted maxillary second molars: literature review and radiographic survey of 1,200 teeth. J Endod. 1989;15(3):129-31. doi: 10.1016/S0099-2399(89)80134-7. [PubMed: 2691624]. 5 Badole GP, Bahadure RN, Warhadpande MM, Kubde R. A rare root canal configuration of maxillary second molar: a case report. Case Rep Dent. 2012;2012:767582. doi: 10.1155/2012/767582. [PubMed: 22830061]. [PubMed Central: PMC3399371]. 6 de Almeida-Gomes F, Maniglia-Ferreira C, dos Santos RA. 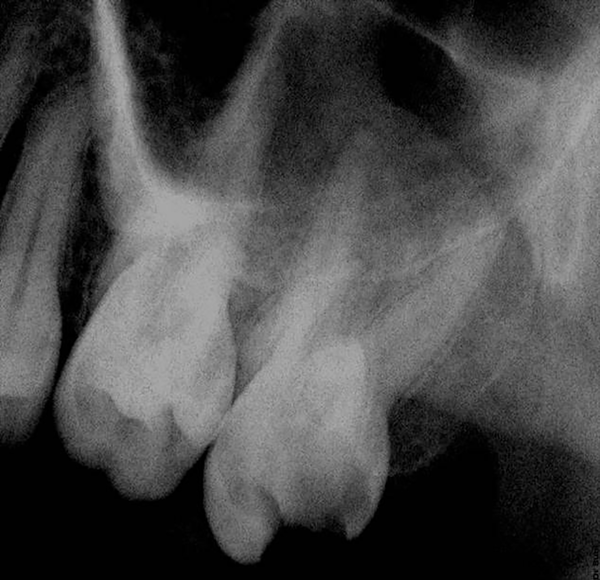 Two palatal root canals in a maxillary second molar. Aust Endod J. 2007;33(2):82-3. doi: 10.1111/j.1747-4477.2007.00057.x. [PubMed: 17697249]. 7 Pasternak Junior B, Teixeira CS, Silva RG, Vansan LP, Sousa Neto MD. Treatment of a second maxillary molar with six canals. Aust Endod J. 2007;33(1):42-5. doi: 10.1111/j.1747-4477.2007.00059.x. [PubMed: 17461841]. 8 Eskandarinezhad M, Ghasemi N. Nonsurgical endodontic retreatment of maxillary second molar with two palatal root canals: a case report. J Dent Res Dent Clin Dent Prospects. 2012;6(2):75-8. doi: 10.5681/joddd.2012.016. [PubMed: 22991641]. [PubMed Central: PMC3445319]. 9 al Shalabi RM, Omer OE, Glennon J, Jennings M, Claffey NM. Root canal anatomy of maxillary first and second permanent molars. Int Endod J. 2000;33(5):405-14. [PubMed: 11307458]. 10 Green D. Morphology of the pulp cavity of the permanent teeth. Oral Surg Oral Med Oral Pathol. 1955;8(7):743-59. [PubMed: 14394660]. 11 Vertucci FJ. Root canal anatomy of the human permanent teeth. Oral Surg Oral Med Oral Pathol. 1984;58(5):589-99. [PubMed: 6595621]. 12 Christie WH, Peikoff MD, Fogel HM. Maxillary molars with two palatal roots: a retrospective clinical study. J Endod. 1991;17(2):80-4. doi: 10.1016/S0099-2399(06)81613-4. [PubMed: 1919407]. 13 Alani AH. 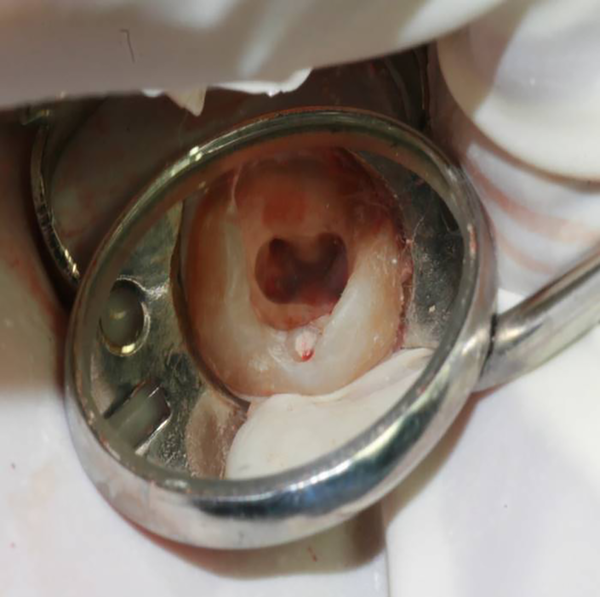 Endodontic treatment of bilaterally occurring 4-rooted maxillary second molars: case report. J Can Dent Assoc. 2003;69(11):733-5. [PubMed: 14653939]. 14 Shojaeian S, Ghoddusi J, Hajian S. A case report of maxillary second molar with two palatal root canals and a furcal enamel pearl. Iran Endod J. 2013;8(1):37-9. [PubMed: 23411467]. [PubMed Central: PMC3570966]. 15 Fahid A, Taintor JF. 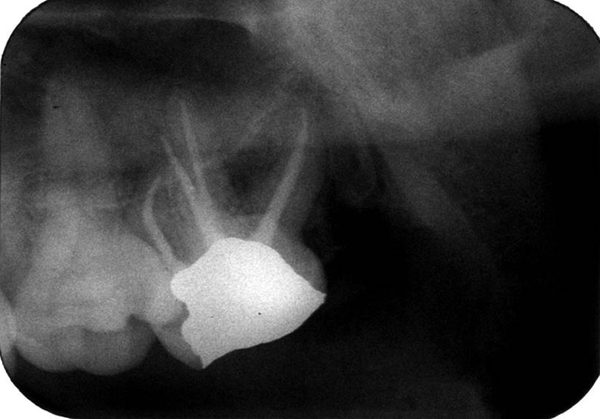 Maxillary second molar with three buccal roots. J Endod. 1988;14(4):181-3. doi: 10.1016/S0099-2399(88)80261-9. [PubMed: 3268638]. 16 Benenati FW. Maxillary second molar with two palatal canals and a palatogingival groove. J Endod. 1985;11(7):308-10. doi: 10.1016/S0099-2399(85)80163-1. [PubMed: 3862743]. 17 Deveaux E. Maxillary second molar with two palatal roots. J Endod. 1999;25(8):571-3. doi: 10.1016/S0099-2399(99)80383-5. [PubMed: 10635225]. 18 Peikoff MD, Christie WH, Fogel HM. The maxillary second molar: variations in the number of roots and canals. Int Endod J. 1996;29(6):365-9. [PubMed: 10332235]. 19 Versiani MA, Pecora JD, de Sousa-Neto MD. Root and root canal morphology of four-rooted maxillary second molars: a micro-computed tomography study. J Endod. 2012;38(7):977-82. doi: 10.1016/j.joen.2012.03.026. [PubMed: 22703664].